This is mostly a personal choice for men's dress shoes. Usually, the fancier your clothing, the more you'll like detail on your shoes. Plain is fine, though. It's also incredibly versatile. You won't feel like you've got too much going on within your attire if you keep your shoes simple. So shine 'em up, and wear 'em out. 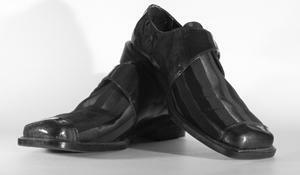 Speaking of toes, the rubbery-soled, square-toed men's shoes like Kenneth Cole offers are not a good look. They tend to look comical on a large portion of the population. Tapered ends, although not necessarily pointy, are much more flattering. There are two American brands of men's shoes that get tons of love from businessmen with style. Those two brands are Allen-Edmonds and Alden. What makes them so special? The varying widths make them especially good choices for hard-to-fit narrow feet. So many men chose either black or brown shoes and then wear that pair every day. Guys, do your wardrobe a favor! Impress your woman by choosing brown AND black shoes. Switch it up depending on the pants and shirt you wear that day. If you must choose one or the other, take a look at your wardrobe. If you wear a lot of black clothes, you should obviously choose a pair of black shoes. If you wear khakis frequently, you can choose black or brown shoes. The same goes for blue jeans. As far as shirts are concerned, generally warm tones look best with brown and cool tones look best with black. Warm tones include: yellow, camel, brown, orange, red-orange, olive green, and coral. Cool tones include: blue, purple, blue-red, pink, and blue-green. Read reviews and try the shoes on before your make your purchase. Unless you order from somewhere with an unusually liberal return policy, you're not going to be able to return them after they've been worn outside the house. Try your shoes on with the pants you want to wear them with to make sure they don't make them look too short. You also want to make sure you don't look like you've got clown feet. Some styles will make your feet look longer and/or wider than they really are. Whatever the color, please don't wear socks with your sandals! If it's that cold, put your boots back on. Wear sandals with shorts, jeans, or cargo pants. Choose from thongs, slides, dress sandals, and fisherman style shoes. Thongs and slides slip on and off and are extremely casual. Dress sandals are worn with your "nicer" casual clothes. Fisherman style has the sportiest look. Timberland boots: These simple brown boots can give a regular shirt and pants an All-American air. Converse sneakers: Old school's always good. Nostalgia's a grand feeling. Athletic shoes. They don't always have to be on the track, on the field or on the court. Which Shoes Go with What? Simple black or brown lace-up Doc Martens Shoes go with everything casual. They can even complement business casual attire if you get a versatile pair.Sandals are best with shorts because socks aren't necessary. Wearing socks with shorts can sometimes be tricky. Another option, if you're going for a sporty or super casual look, is a pair of sneakers. Doc Marten men's shoes are a great choice if you're wearing a casual khaki pant. Another option--sandals with super casual khakis. Think cargo pants. Dress pants look great with a pair of Allen-Edmonds or Aldens. If you've got money to burn, you could invest in the uber-pricey but fabulously rich and detailed Vass, John Lobb, or Edward Green brands to wear with your suit. What Are the Best Men's Shoe Stores? You can also look at any major department store's website and find shoes of all kinds.